Step from your speedboat straight onto the sands of Hon Tam Eco Green Resort, a delightful, holiday experience is shared by you and just a few fellow kindred spirits. Located in south of Nha Trang Bay, 5km from the shore, Hon Tam Island is an appealing sea island ecotourism resort which is one of Vietnam’s most authentic environmentally sustainable resorts and is located in one of twenty most breathtaking bays of the world and one of nine most stunning island of Vietnam.Here remains natural deserted beauty with tropical evergreen forest and the endless winding white-sand beach. Lush gardens captivate the senses with their artful combination of visual designs and aromatic selections of careful chosen plantings.Reliant upon solar power, wind power, natural gas and collected rainwater, Hon Tam Eco Green Island prides itself in being boldly green, whilst maintaining absolute luxurious comfort for even the most discerning travelers. Let us spoil you with our all inclusive services! 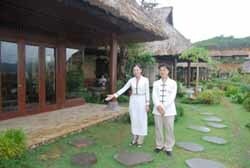 Invested by international standard, Hon Tam Resort comprises of 50 bungalows nestled amid lush rain forest, a luxurious 4-star-hotel with 224 rooms (operation in 2010) and a recreation center.The stylish bungalows are spacious, sophisticated and perfect for couples, families and anyone who love nature and tranquility. The enormous list of exclusive activities include: 2 comfortable swimming pools, 3 full-size tennis court, a modern Golf practice court & motorized water-sport center.In addition, the three restaurants offer a wide range of cuisine from Western and Asian Fusion, Fast food to delicious Nha Trang Sea food.The Hon Tam philosophy is that by temporarily escaping from crowds of people and the normal distractions of modern life, guests really connect with themselves those around them, and the environment - in a way that helps them rediscover the simple pleasures and natural rhythm of life. Hotel rates per night are inclusive of government tax, service charge . Single room = One person, Twin room = Two persons, Triple room = Three persons, including extra bed. Family Suite:The luxurious Family bungalows are perfect for couples or families.Across the large balcony, provided with comfortable deck chairs, a brilliant glass door opens to a spacious room with queen-sized bed, day bed, desk and closet. The rich color, quality furnishings, lighting and the use of natural timber ensure the energy of Romance. Garden Restaurant:Located conveniently near the pool and beach, 150-seat-Garden restaurant serves breakfast at 7am-11am, lunch at 11am-3pm and dinner at 6pm-11pm.The tropical proposes a Western and Asian Fusion. Ocean-view Restaurant:The resort main restaurant, located between luxurious guestroom and Recreation Center, seats 600 guests and opens daily from 8:00 AM to 5:00 PM.It proposes Nha Trang Seafood Cuisine with a wide range of the North-Central-South food specialties that are surely to please guests of all ages. Warm red walls and dark wood trim create a cozy ambience, and also bamboo and soft upholstered furnishings create a welcoming Hon Tam Paradise feel. Golf Club Café:Right at the Golf Service house, you can find the casual and fund restaurant. The Golf seats 100 guests and serves lighter, family-friendly fare such as pastas, pizza and burgers as well as tea, fruit drink.A total of three bars will keep guests cool with a wide range of signature cocktails, top-self liquor, wine, beer and non-alcoholic beverages. Flamingo Bar:The expansive and centrally located main lounge also overlooks the pool and offer killer view of the entire cove.It’s the place where guests can meet and socialize, with fun and refreshment, and ideal place to enjoy light lunch, snacks, beer and nonalcoholic beverages and relax in the fresh sea breeze. The Saloon:Need to look your best for a special night, or just hoping to freshen up your look while you’re on vacation?Spring Spa offers a full-service hair salon, so guests can look their best for a special day, or just for the fun of it. Try out a new look with a stylish hair cut, color or hair style – and even up-dos for your special event.